2003 brings back a lot of fond memories since that was the year that my interest in the medium was rekindled after going on a one-year hiatus. By that time, I had completely settled into my new environment, made quite a few friends, and more importantly, I had a sense of direction. That peace of mind helped free up more time and through a friend, I was compelled to give anime another shot since a lot of good shows were airing, some of which would end up on my all-time favorites list. It would be an overstatement to call this period an anime renaissance, but at the time, it sure felt that way to me. Note: Youtube videos are spoilered, clips contain the entire track, and with that, let’s go! Anyone who has known me for any significant length of time will know that if given the opportunity, I can babble on and on about how awesome Gunslinger Girl is. And how could I not? Everything about the show caught my attention straight away, from the crisp, detailed art and animation to the plot, and it effectively brought me back into the fold and held me there but good. But the music… Gunslinger Girl’s soundtrack was an utterly beautiful piece of work that I would not hesitate in putting in a top 10 soundtracks list if I ever decided to sit down and take the time to cobble one together. Toshihiko Sahashi really outdid himself with the classical-style melodies that conveyed the action and the setting wonderfully. The “TEMA’s” are pretty much the foundation that the soundtrack is crafted behind, and I love “TEMA I’s” melancholy violin melody the best out of them all though “TEMA IV’s” intensity will always be a favorite too since it does a good job of bringing on the action. Concentrating on the themes alone would mean missing out on a lot of other excellent pieces such as “Bucolica” and “Ti Amo” which depict the characters’ day to day life in the European perfectly allowing you to immerse yourself in the setting. And lest I forget, the OP, “Light Before We Land,” also had the effect of tuning me into the Delgados, and I really like the music from their Hate album. The only other show that could hold a candle to Gunslinger Girl was Full Metal Alchemist, which kept me in rapt attention with its ambitious plot and enjoyable cast of characters. It also served as my introduction to Michiru Ooshima’s works which, as I’ve commented before, tends to be fairly consistent from anime to anime. I don’t think I’ve ever heard a bad soundtrack from her ever. She just captures the drama and action so well. Whether it’s the novelty factor of hearing Ooshima for the first time or the nostalgia factor surrounding FMA, I don’t know, but I’m still tempted to call this her best soundtrack to date. The action sounds have the required level of intensity so that you can feel the sense of urgency floating about, but the drama inherent in the tragedies that the brothers Elric are forced to endure is conveyed most poignantly through “Brothers.” “Kiro” is also memorable in the way in which the scope of the series is brought to light by giving the listener a taste of the show’s ambition through the militaristic beats and the grand, epic orchestral pieces. That people lament the lack of Ooshima in the latest rendition of the FMA saga just goes to show just how strongly people linked her music to the series. Akira Senju’s compositions are good enough, but without “Brothers,” something still feels missing. Since we’re on the subject of grand adventures, how about some Last Exile? That show had quite a bit of that, didn’t it? But while the militaristic tracks like “Chivalry Spirits” are fine in my book, the compositions from the show that stand out the most are the ones that evoke the feeling you get as you look upon the the rustic, Irish countryside through the mixture of accordion, guitars, violins, and woodwinds that this soundtrack is filled with. For that matter, it’s the Irish inflections in the sound that helps differentiate this album beyond your typical adventuring anime soundtrack and so, I prefer tracks such as “Morning in Norkia” and “Workin’ on the Cloud.” Also, Hitomi Kuroishi’s singing isn’t my cup of tea, so I’ll give her vocal tracks a pass when I listen to the soundtrack. That adventuresome theme also means we turn towards Wolf’s Rain, where Kanno’s eclectic mix of Latin rhythms and orchestral works make for an enjoyable listen overall. As you can probably guess, I have a stronger bias in favor of her orchestral compositions, and so, “Shiro Long Tails” will always earn a firm nod for its memorable, melancholy melody. But also, let us not forget Maaya Sakamoto’s performance in “Gravity,” which should get some sort of award for being one of the most poignant ending themes ever. I mean, it’s survived this long and has been a fan favorite since it came out in 2003. Chrono Crusade was also a show worth mentioning because it was my first exposure to Hikaru Nanase’s works. Her dark, gothic melodies earn a thumbs up from me, some of the sillier Rosette-oriented tracks are a bit annoying, only because one is an arrangement of the other and only a careful listen will really allow you to differentiate them. Still, the standouts are the OP, “Tsubasa wa Pleasure Line” sung by Minami Kuribayashi and the ED, “Sayonara Solitaire” composed by Yuki Kajiura and sung by Saeko Chiba. Chrono Crusade might be one of Gonzo’s more underrated works. At least, I hardly see ever hear people discussing this show. All suspicions for this lack of discussion seem to center upon a mysterious organization known only as the Cult of the New. And while we talk about shows that hardly ever get mentioned, I don’t see Scrapped Princess getting much love either. The few words that I can use to describe this is that for all intents and purposes, Scrapped Princess was a JRPG that was turned into an anime (Utawarerumono is a more egregious example of this). Also composed by Hikaru Nanase, I can’t claim to remember a thing from the soundtrack, and so, I must present you with the OP, “Little Wing,” since you can never go wrong with JAM Project. To shift gears a bit, maybe someone can update me on what’s going on with Mikuni Shimokawa. I was first aware of her when I watched Full Metal Panic, but it was in the Fumoffu spinoff that I really appreciated her singing a whole lot more. During 2003 and for many years thereafter, “Sore Ga Ai Deshou” was my favorite anime song, and one that I’d foist upon any unsuspecting anime fans who had not heard that piece. The ED, “Kimi ni Fuku Kaze,” isn’t as awesome compared to the OP, but I also enjoyed that one a whole lot, probably because the little marching figures and the rhythm has driven it into my mind forevermore. Soundtrack is more of Toshihiko Sahashi from the first series, so you know what you’re getting into. Kino’s Journey also features Shimokawa in the OP “All the Way” which was a really catchy song. It also was totally out of place with the general atmosphere that Kino’s Journey established through its vignettes. My guess is that they were trying to bring forth a sense of discovery since the song does a good job of making me want to pack my bags and explore the world so that I can marvel and experience all that life has to offer. After all, I maintain that traveling broadens ones mind, allowing one to see things from a different cultural perspective. Finally, we come to Planetes, the show that I’m still guilty of not having seen to completion. In listening to the music by Kotaro Nakagawa (of Code Geass fame), I can’t help but feel a sense of grandiosity through the first track, “Outside Atmosphere,” which is marvelous as it gets you to think upon the pictures of Earth that we’ve all seen before in our textbooks. It’s an image most of us will probably never experience in person, but it never fails to leave me in awe and wonder as I look at it and realize that the sum total of the human experience is encapsulated on that tiny sphere. The rest of the soundtrack is good too, but I don’t think they deliver on as strong a first impression like “Outside Atmosphere.” Yes, I really do pimp this song a bit too much. A limit does need to be set on the number of times I mention that I haven’t seen Someday’s Dreamers and my overriding need to listen to Takefumi Haketa’s soundtrack the whole way through since I was so impressed by “Where the Sky and Earth Meet” (found on a MALKeionbu compilation near you!). My advice is to grab the compilation, and if you liked what you hear, give the show a shot or the soundtrack a listen. R.O.D. TV gets a lot of mixed opinions and I’m on the side that found the story to be enjoyable. It also gets a lot of flak for using the same themes from the OVA, but I don’t find this to be a major fault since Iwasaki arranges the main theme so that each variation is enjoyable on its own. But then again, I’m big on the whole “theme and variations” bit that composers do (“Rhapsody on a Theme by Paganini” comes to mind). Anything else that I missed other than possibly Tokyo Godfathers? I’ve been meaning to watch that, but I just haven’t found the time. And by that, I mean muscle out a block of time since it’s been hard finding the free time to actually hit my backlog, what with the stuff that’s currently out. It’ll sit on the back burner along with just about everything else. Gunslinger Girl, Kino no Tabi, Wolf’s Rain, Planetes, and Shigetsutan Tsukihime’s OP are all great. 2003 does bring a lot of fond memories for me as well. As for Ooshima, I like her music too, but I would also like to see more originality between her works, part of the ‘Le Chevalier D’Eon soundtrack is just too similar to her previous works. This holds also true for Senju Akira (loved the ‘Red Garden’ OST) and Kenji Kawai, sometimes they seem to copy 1:1 from themselves (Kawai in GitS movie and Seirei no Moribito). Ha, this makes me remember how astonished I was when I discovered how thoroughly Hisaishi ripped off ‘The Alan Parsons Project’ on one piece. Oops, I am deviating from the topic. ‘Wolf’s Rain’ music is also always good to listen to, Steve Conte’s voice got something. What I ‘dislike’ (not a real dislike) about Yoko Kanno is that she quite often tends to get too exuberant in her arrangements in the second part of a song (e.g. ‘War Ship’ from ‘Brain Powerd’). As for the ‘RahXephon’ movie, I didn’t really like ‘Garden of Everything’ by Kanno, my fav is ‘Katun no Sadame’ by Hachimoto Ichiko, somehow I can listen to this song over and over since it has such a soothing effect on me. You should definitely watch ‘Tokyo Godfathers’, reminds me of good screwball comedies, it’s very, very funny. The music is o.k. and fits the movie well, it isn’t just that suited for standalone listening (at least for my tastes). 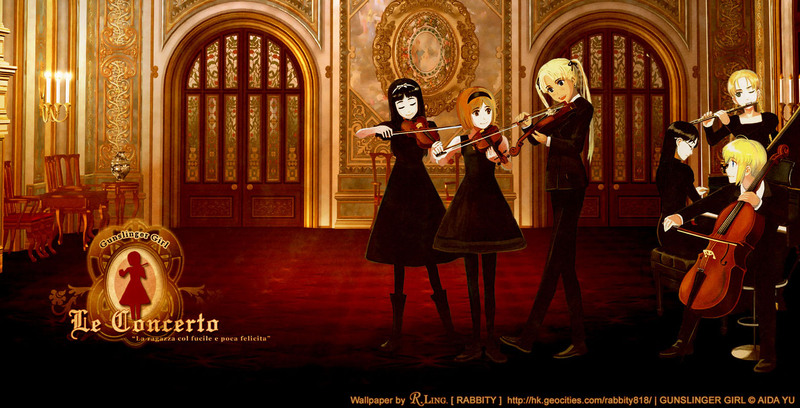 Gunslinger Girl remains one of my all-time favorite soundtracks. An amazing theme, powerful orchestration, and beautiful, peaceful tracks set it apart from your average soundtracks. Michiru Ooshima is definitely above average, but I find her works not as emotionally driving as other composers on average. I havn’t actually seen FMA, so I don’t have anything to relate her music to, and as a result, some of her tracks sound either slightly generic or aimless. So many good orchestral pieces for this year! I agree with Chrono Crusade and Scrapped Princess being underrated, Cult of the New indeed. I thought Someday’s Dreamers was a bit boring, but this is coming from someone that fell asleep watching Aria. Too much slice of life for me to handle. It’s been a blast digging into the music for a lot of these. Talk about a nostalgia rush upon listening to this and being reminded of all the shows that have come before. It’s also a sign that I need to 12 Kingdoms since I actually did not know that, so thanks for the heads up. I agree with you on Ooshima since her works don’t really stand out a whole lot from her body of music as a whole. That’s sort of what I meant when I said that she’s consistent; the music is good, but stylistically, there aren’t that many changes. I don’t mind Kanno’s tendency for exuberance since I do think that in doing so, it makes her songs enjoyable outside the context of the anime, but I suppose it makes sense if you’re looking for a more subtle approach to soundtrack composition. Thanks for that lengthy reply! Haha, as I said, I could babble all day about why I love GSG. It also helps that the soundtrack packs a great deal of variety and so, I can never get bored while listening to it. As for Ooshima, I do see what you mean by that since I wasn’t able to completely immerse myself into her soundtrack for Xam’d. That’s not to say it’s bad or anything, but that with her, context goes a long way towards making a piece more enjoyable than it otherwise would be. It really is a shame I think, since those two shows were enjoyable. Might not be the best ever, but I had a lot of fun watching them. I love Last Exile music as much as I love the anime. ‘Lost friend’ is the tract that hit me the hardest partly because the piece was played at one of the most powerful scene of the anime (the death of Luciola). ‘Shiro Long Tail’ is also my favorite track from Wolf’s Rain though I also love ‘My Little Flower’. I forgot to mention that Last Exile’s OP is really quite unique and beautiful. The grandiose yet soothing beats create a really nice atmosphere. It’s definitely memorable; more so than the actual soundtrack imo. Yeah, that was quite an exciting series once things headed up to the clouds. That the soundtrack worked so well is a real testament to how well it was all put together. That ethereal sound that merges into a sort of rock rhythm while maintaining that airy feel does have its attractions doesn’t it? Somehow, I still feel a bit more in touch with the background music, but both are definitely good listens. It’s great that you put emphasis on orchestral pieces, I especially enjoy melancholy ones. Shimokawa’s just gone up and disappeared, hasn’t she? But her music still resonates from the past and they’re quite lovely. Gravity is always going to be that surefire winner as well because of how melancholy it is through and through. Fullmetal Alchemist has a lot going for the series especially the music. It is one of the few non-Gundam anime scores I listen to all the time. There are a lot of memorable themes that really touch the heart when one listens to it. I also like the inclusion of some classical classics like Beethoven and Etude in E Major. Of course, don’t forget about Bratja or Brothers. It would have to be my favorite “sad” song of the decade of anime. Definitely. The themes are really memorable and it’s still hard for me to imagine FMA without having Ooshima behind the score. Tracks like Brothers really drives home the depths of the tragedy the two boys suffered. The inclusion of Beethoven and Chopin were nice touches too. All the classics. It couldn’t be just a mere coincidence I am still keeping most of the soundtracks mentioned here and listened to them from time to time. Best of the bunch would be Last Exile for me. Timeless music indeed! Last Exile is a soundtrack that I don’t think I listen to enough, but it certainly deserves its time out there on my music player. Glad you enjoyed the read. I have listened to the Image Album, but that was years ago, so my recollection is fairly hazy. I don’t remember having a great opinion of it though, mostly because of how I was expecting more orchestral goodness, but didn’t really get much of that. Of course, that kind of judgment would be unfair and I think I need to give it a go once more to refresh my memory. I found it quite different from the OST in general, because it’s composed by a different composer, but I enjoyed hearing instruments that aren’t commonly used in most Jpop compositions nowadays. Last Exile’s OST was brilliant, I listen to it at least once a month. Cover Stories is my favorite track. Looking back, R.O.D The TV’s music kind of surprised me, I wasn’t very receptive to it when I watched the show so many years ago, but just last year I popped it in again and it’s become regular listen for me now. Having not watched the show in so long, the soundtrack gives me a different impression of the series (like, it fits, but I don’t recall how? ), so I’m wondering if I should re-watch the series. (I’ve only watched the original airing, which had some terrible production in a few episodes that was cleared up upon R2 DVD release). Regarding Wolf’s Rain, I’m suprised you didn’t mention Face On, it was this song that moved me so much in the first episode, I couldn’t wait to see where things went. It’s all Yoko’s doing, as usual..
Yup, Last Exile does have that sense of grand adventure really well and it’s one that uses the woodwinds and violin especially well so I’m glad that many people have gotten exposure to its wondrousness. As for ROD TV, at first, I was put off by how similar the music was to the ROD OVA, but as I delved deeper, it got easier to appreciate how well Iwasaki was able to arrange some of the tracks so you get a same-but-different effect. For what it’s worth, I really found the story to be enjoyable and thought it was a solid effort even if it got a bit convoluted at times. And yes, you can never go wrong with Kanno when she helms anything! I’m searching the web to see what Mikuni Shomokawa is doing right now. After she released her single for the Fairy Tail single in 2010, she completely dropped off. I found out she was married in 2012 on Valentine’s Day, but aside from that, nothing. Most of her recent blog pictures and posts are about food. I think she’s on hiatus, if not retired. Yeah, I’d say it’s safe to expect that she’s retired. I’m not really counting her to release a new single unless something crazy like a new installment of the Full Metal Panic Series gets released.